The Soul Has No Memory! Many people believe near-death experiences (NDEs) and out-of-body experiences (OOBEs) are true manifestations of a temporary separation of the soul from the body. This website describes several exhaustively analyzed examples of these experiences. For example, the dentureman NDE, the Pam Reynolds NDE, and the Eben Alexander NDE. But is this reality or a misguided illusion? One way of analyzing the reality of this belief is to examine whether memories are located within the soul, or within the physical brain. Indeed, when viewed from the viewpoint of the mind-model of dualism—OOBEs and NDEs are due to a temporary separation of the soul from the body, which means that the soul is the indelible repository of new and old memories. The reasons for this belief are evident in the descriptions of these experiences. People report remembering, and recognizing the appearances of automobiles, buildings, trees, and multitudinous other objects during NDEs and OOBEs. If memories of these things, objects, animals and people were not retained within the soul, the soul would not recognize these things when disembodied. People who meet deceased relatives, recognize their relatives while undergoing these experiences. This appears to indicate that their dissociated souls retain older long term memories of these persons and their appearances. People who hear subsequently verified conversations and speech while undergoing these experiences, recognize the words and understand what is being said. This apparently means that the soul is also the repository of long-term memories of language, otherwise the dissociated soul would be incapable of understanding speech. People sometimes report seeing things and hearing things while undergoing these experiences during states of apparent death or unconsciousness. This apparently means the soul is something independent from the physical body, is capable of hearing speech and seeing with light, as well as being capable of remembering these things while disembodied. If the soul was incapable of forming new memories while disembodied, no-one would be capable of remembering an OOBE or NDE. Accordingly, it is not surprising that many believers in the reality of the soul, and the literal reality of these experiences, consider memory to be one of the many properties of the soul. 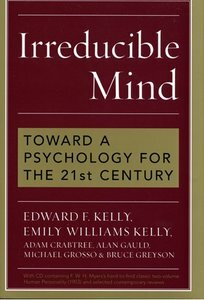 Indeed, it is a key, and important property of the soul as discussed in the book “Irreducible Mind”. The disembodied soul remembers persons, language, the names and sorts of objects in the physical world, book learning, and all manner of things learned through the senses of the physical body when the soul is embodied. This means that perceptions and learning made with the senses of the physical body are somehow transferred from the physical body to the immaterial soul which then remembers them. Things observed and perceived by the disembodied immaterial soul during OOBEs and NDEs are remembered by the soul. When a conscious person is requested to recall something, or a person spontaneously recalls something such as an OOBE or an NDE, the embodied immaterial soul retrieves these memories, and somehow controls the material body to recount these memories through the mechanisms of the body. This is how the mind-model of dualism proposes how memory functions. But is this reality or illusion? The soul forms and retains no memories! Memory is an absolutely essential property of the human soul—yet even though the soul is supposedly the vehicle of the conscious mind and memory, is unaffected by things affecting the physical body, and is continually conscious—the soul cannot remember actions, deeds and speech performed while the physical body was physically conscious under the influence of some drugs. The above putative memory function of the soul is rendered nonsensical by a simple daily observation by all practicing anesthesiologists. Anesthesiologists and other physicians regularly inject small doses of a drug called midazolam to reduce anxiety, and to sedate patients. Patients sedated and rendered free from anxiety, are cooperative, perform actions they are instructed, converse, and respond with conscious directed actions and deeds. Yet they nearly all forget everything occurring during the period they were sedated with midazolam. This has profound implications for the location of memory. So how does the mind-model of dualism explain the amnesic effects of midazolam? The explanation is somewhat more complex, so I will put it into the form of a list (see paragraphs 7.75-7.86 in Chapter 7 of Illusory Souls). The mind-model of dualism states that the physically conscious body of a person is a sort of mindless robot under the control of the soul. Midazolam administered at doses sufficient to cause amnesia does not induce loss of consciousness. After such doses of midazolam, most people are somewhat sedated, yet perceive and react appropriately to their surroundings. They are cooperative, talk normally, answer questions appropriately, and otherwise react appropriately with speech and movements. According to the logic of dualism, the physical body transmits perceptions of speech, sight, touch, and surroundings in some way to the soul, which then controls the body to speak, move, and act appropriately in response to others and the situation. Believers in the mind-model of dualism claim that the soul is the indelible repository of all memories. 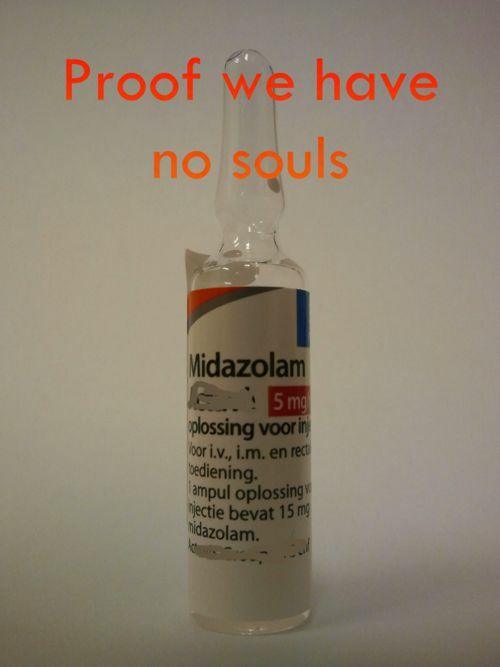 The mind-model of dualism states that the soul is unaffected by drugs affecting the physical brain. Therefore, according to the mind-model of dualism, memories of thoughts, speech, actions, deeds, and perceptions made while sedated with midazolam, but physically conscious and cooperative, are all indelibly stored within the soul. All physical brain functions return to normal after the body eliminates all the administered midazolam. Memories of the perceptions, speech, sounds, and events occurring around the conscious physical body while under the influence of sedative doses of midazolam, are public memories. They are memories much like hearing and remembering a conversation, hearing a sound, or remembering a snippet of news from a newspaper. They are public memories—not memories of anything secret, intended only for the use of immaterial beings or souls. Therefore there is no conceivable reason why people cannot recall conscious actions and speech during procedures performed under midazolam sedation. So if the soul is the indelible repository of all memories, then all people should be able to remember all that occurred while sedated, but physically conscious and cooperative. But most people remember nothing of what they thought, said, did, or perceived during the period their physical brains were affected by midazolam. Memory is an absolutely essential property of the human soul, yet even though the soul is supposedly the vehicle of the conscious mind, is unaffected by things affecting the physical body, and is continually conscious, and controls the physical body to act and to speak. Yet this amnesia is observed daily, all over the world wherever midazolam is employed for both its conscious sedation and amnesic effects. It is the daily reality of myself, and all other physicians administering midazolam to the patients we treat. The only explanation for all these repeatedly observed facts is that the soul is not the repository of memories, but that the physical brain forms and retains all memories. The book Illusory Souls provides many different proofs clearly demonstrating the objective lack of any sort of memory function in the soul. Interested readers can read Illusory Souls for detailed descriptions of these many proofs of the illusory nature of the human soul. All such proofs are repeatedly observed during daily clinical practice. Absence of memory in the soul has far-reaching consequences. This means that NDEs and OBEs are internal illusions and hallucinations. Claiming that the soul remembers these experiences does not correspond with provable clinical reality. Any explanation must explain this physical reality, as well as the apparently non-physical reality of these experiences. Any other explanation is an illusion. The soul is not the seat of memory, therefore reincarnation is a fable, because without memory a reincarnated soul can neither learn nor develop. The soul has no memory—therefore punishment in hell, or reward in a future heaven, are no more than fables. A soul without memory is a mindless something, and can neither be punished nor rewarded. Illusory Souls is replete with many analyses of observations from anesthesiology practice and medicine. All such analyses reveal that the soul possesses no memory ability, no ability to sense anything in this world, or act in this world except through the senses of the physical body. The same analyses when applied to out-of-body experiences and to near-death experiences reveal these same things. Insights and analysis using the tools of anesthesiology and medicine, reveal we have no souls with the properties claimed by popular belief systems or world religions. Accordingly, near-death experiences and out-of-body experiences are internally generated hallucinations whose content may sometimes be modulated by external stimuli.